TLUD-boichar ecosystems are complex, so how do we introduce the Akha Chula and biochar to the public? Our main approach is through village clubs called Biochar User Groups (BUGs). A BUG is organized by the Akha-Biochar Project, and is mostly composed of married couples with a strong interest in learning about the Akha and biochar. There are hands-on workshops on how to use a TLUD, fuels and cooking. Biochar is explained, and members are advised on how to use it their own gardens and fields. The BUG members are Project collaborators. 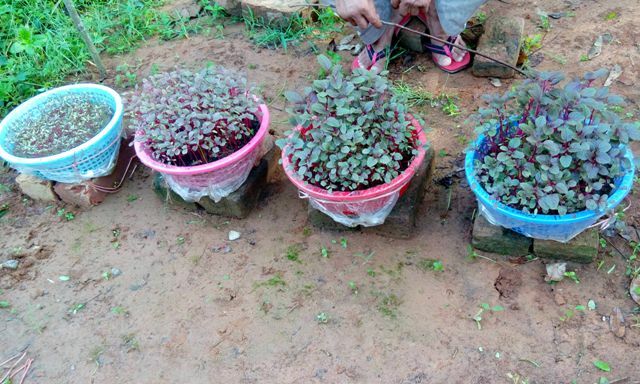 They help to evaluate Akha models, and test biochar in their home-gardens and on their farms. Through informal comments and group discussions, their views are used to adapt the technologies and pose new research questions. Back in their villages, they help to create public awareness of the Akha through their friends and acquaintances. 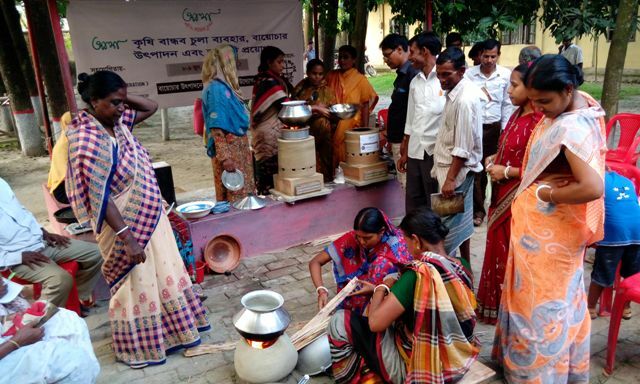 Since BUG members play an important role in technology development and the diffusion of knowledge, the Akha-Biochar Project prefers to attract those families that have an active interest. An initial workshop is held to introduce the Akha and biochar to a village. If any of the attendees are interested in joining a BUG, they pay a modest membership fee. Members of a BUG demonstrate interest in getting an Akha by preparing fuel. By attracting people who show a strong interest, the Project ensures that the participants give the Akha and biochar a fair trial. 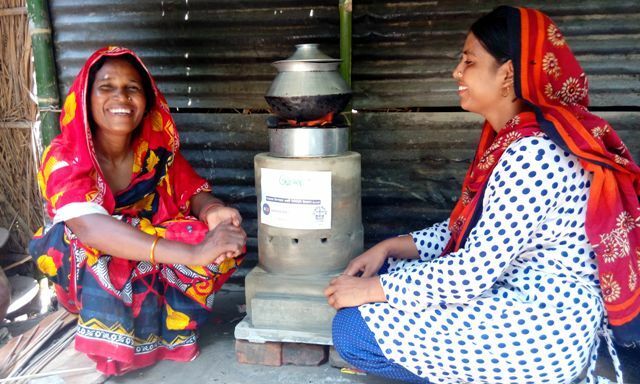 These early adopters of the technology are able to reliably explain their stove and biochar to their friends and neighbors. Figure 3. The BUGs set-up demonstration experiments to show how biochar can be used to enhance soil productivity. Experts from universities and the Bangladesh Agriculture Research Institute visit to give workshops. 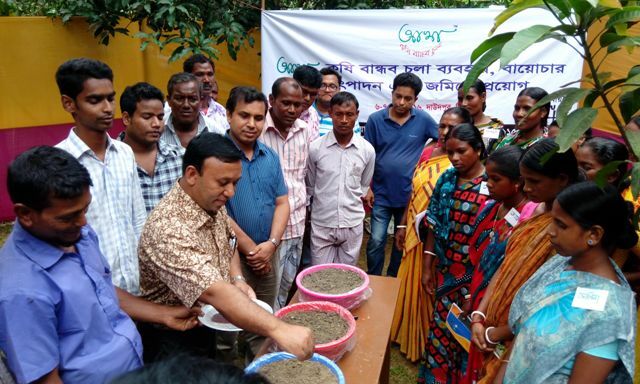 Here, Dr. Shah Moinur Rahman from the Soil Science Department, Hajee Mohammad Danesh Science and Technology University plants a demonstration trial with biochar and cow manure. Figure 5. Ms. Monowara Begum (left) and her neighbor with her new Akha. After workshops on using TLUDs, preparing fuels, and a Cooking Performance Test, Akha Chulas are installed in a BUG member’s homes. 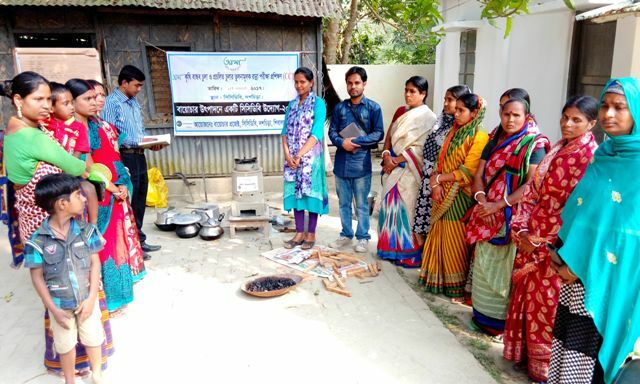 Mentoring by Project extension personnel ensure that the stove is properly installed and operated. Smoke production is very low. They like the consistent production of heat without stoking, leaving them free to do other tasks. They don’t mind that the Akha is taller than a traditional stove, and like standing to cook. The production of biochar is a very important reason for using the Akha. They do find breaking wood into small pieces is a chore. 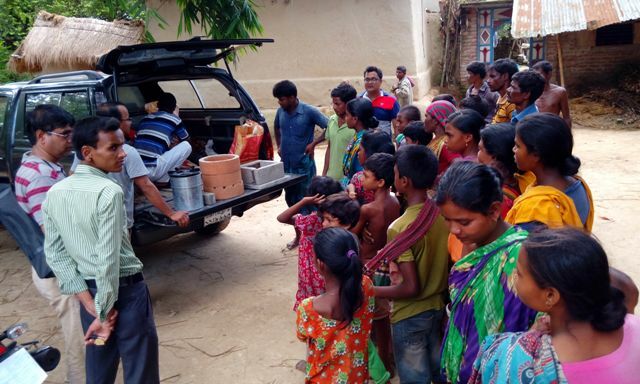 The importance of char-making to Akha adoption emphasizes the necessity of introducing TLUD-biochar technologies as a package [TLUD-Biochar Ecology], rather than the stove and biochar on different occasions. Exploring the uses of biochar in homestead gardens and farms is another role of BUG members and for Biochar Farmers Groups (Figures 6-8). Figure 6. 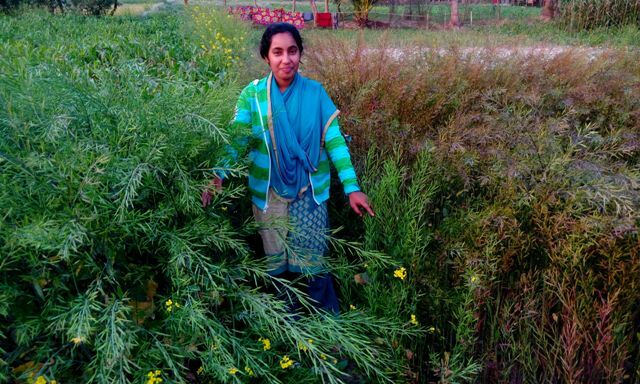 Mrs. Shewly Begum is using biochar in her homestead garden. Here she shows the increase in growth of her mustard crop. Figure 7. Vogirot Tati, a farmer from the Manda Upazilla, Noagon District, explains his potato experiment with biochar mixed with poultry manure or cow dung. He is a lead farmer (Agri-Entrepreneur) member of a biochar farmers group. His wife produced the biochar with their Akha stove. Vogirot says that his biochar-treated soil held more moisture than non-biochar soil. Advising on this experiment is senior scientist Dr. Md. 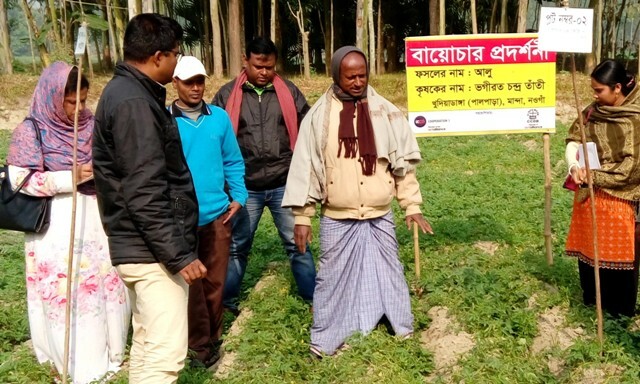 Masuduzzaman Masud from the Bangladesh Agriculture Research Institute (left, foreground). Figure 8. 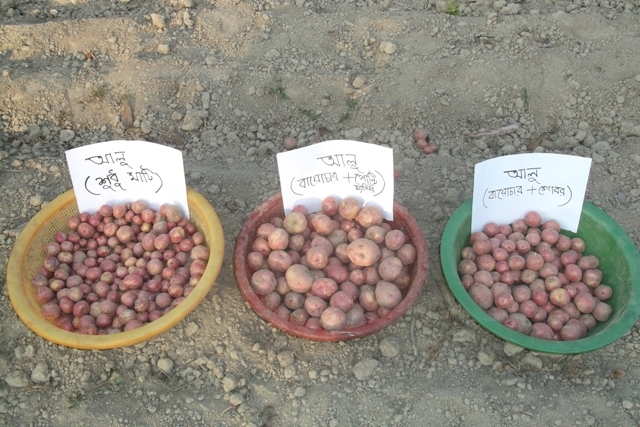 Potatoes from Vogirot Tati biochar plus manure experiment, shows the effect of biochar and manure on the size of potatoes. Treatments are: (left) unfertilized soil, (center) soil + biochar + poultry manure, and (right) soil biochar + cattle manure. The BUG families and farmers become the new teachers diffusing their knowledge through their social networks. This creates a demand for TLUD/biochar technology that will be met as the Akha-Biochar Project trains local entrepreneurs to make the stoves. Figure 9. Awareness of TLUD/biochar technology is created as friends and neighbors of BUG members look on. If their experience is favorable, demand for stoves will be created through social networks. In future, new biochar technologies, such as water filtration and remediation of saline soil will be introduced through BUGs. BUGs can also be used to coordinate families into collective enterprises that will connect them with distant consumers, and increase cash flow into their villages (“base of the pyramid” business models). If TLUD/biochar technology increases family wealth, we can use BUGs to demonstrate other technologies such as solar power, and LED lighting. Prototype BUGs are being run by the staff of The Christian Commission for Development in Bangladesh (Estb., Dhaka, 1972), with funding from the Interchurch Organization for Development Cooperation (ICCO) – Netherlands.